The taking of snuff really hit Britain in the 18th Century and the popularity of it grew, particularly in coal mining areas as taking anything such as matches or lighters to enjoy a cigarette, or pipe, were strictly forbidden. Snuff taking is now making a comeback; there are some very good reasons for this, primarily the restriction of smoking in enclosed public places, which can also sometimes include vaping. Many smokers also believe that it is a healthier option, nicotine can be rapidly absorbed into the system by taking snuff, and snuff is free of tar and harmful gases such as carbon monoxide and nitrogen oxides reducing the risk of lung cancer, bronchitis, emphysema, and possibly coronary heart disease as well. For many the downside of taking snuff is the method that has to be used, taking a pinch, placing it on the back of the hand are two examples, however there is a much simpler way now thanks to the Blizzard II snuff bullet. This clever device allows you to take a it whenever you want, out and about, or sitting quietly at home, you use it in the same way as you would using an inhaler for a blocked nose! Simply unscrew the base of Blizzard, fill it with your favourite blend of snuff, and close it with the arrow pointing in a downward direction. When you need to take some snuff, hold the Blizzard down and flick some snuff into the compartment, place the tip into the nose and wow, a wonderful hit time and time again. 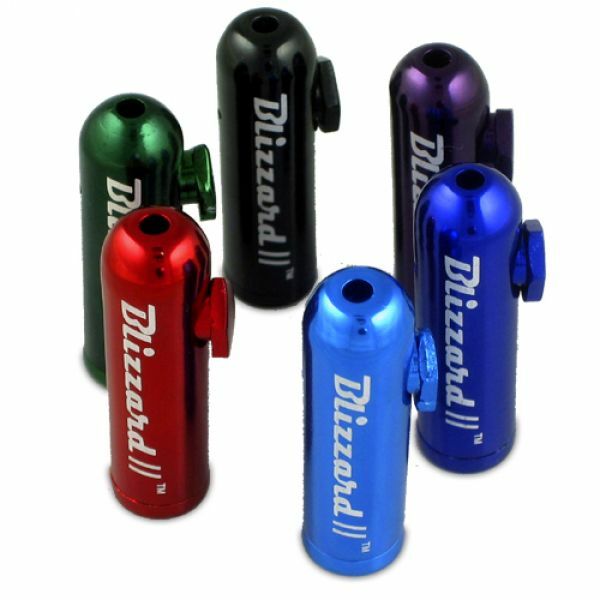 Offered by us in six snazzy colours, gun metal grey, orange, blue, purple, black and light chrome; we have recently been able to offer this in a heavy chrome as well and all are priced at an affordable £12.99, or a specially discounted rate of two for only £20.00, a him and hers perhaps! Your friends will think that you have armed yourself with a rainbow gun, and these fancy items are the bullets, the difference is that these bullets will blow you away and no one else, until they get their hands onto one that is.